The Employee Provident Fund Organization has made it mandatory for all their members to link their Aadhaar number to their EPF account. This is after the organization has introduced most of their services online for their members. Services being offered online include PF account balance, PF statements,submitting online PF transfers, partial / full withdrawal of money from your PF account and many more. Aadhaar is an essential document containing details like name, date of birth, address, photo, etc.. and is used for verification purposes for KYC. However, to enjoy all these services being offered, you have to link your Aadhaar number to your Universal Account Number.For members who also want to settle their claims fast and quickly, make sure that your bank details in your UAN interface have been authenticated to your Aadhaar number. This will ease the whole process of claim settlement. All members can now get their Universal Account Number by themselves. Employee Provident Fund Organization recently launched another program known as the Aadhaar Based Universal Account Number(UAN) Allotment. For those employed at large firms with numerous workers, you will find that some companies may find it hard to generate a new UAN number to the new employee. This is due to various reasons like a mismatch when inputting data with Aadhaar. This leads to the process of generating the UAN number consuming lots of time and resources. To save the members from this hassle, the EPFO launched the Aadhaar Based UAN allotment program to assist them in generating the UAN number by themselves without the help of their employers. Initially, only employers could allot and activate the EPF UAN. This is now a thing of the past since employees can also perform this action Online without seeking the help of their employer. Any employee who wants to activate the EPF UAN online must have an Aadhaar Number and a registered mobile number that is linked with Aadhaar details. This is because the registered mobile is important when it comes that verifying your Aadhaar details. 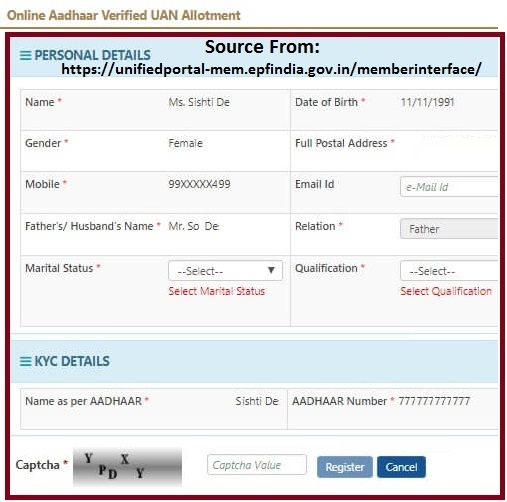 Below is a step by step guide on how to activate the Online Aadhaar Verified UAN Allotment via online through Aadhaar Number and also officials of EPFO has started a new service on Link Aadhaar Number without UAN. You will be redirected to a new page where you will be required to enter your Aadhaar Card Number and hit on the‘Submit’ option. A one-time password will be sent to your registered mobile number that you used while recording with the Aadhaar Card.Those who have not enrolled any mobile number with Aadhaar cannot generate their own UAN unless with the help of their employer. Enter the password sent in the respective field, tick on the disclaimer box and press the ‘Submit’ option. You will be redirected to a new page where you will see your all your details as you recorded them during Aadhaar Registration. Ensure that the details are correctly filled and enter the blank spaces asking you to enter details like Email address, marital status, and qualification. It is mandatory to fill in all the blank spaces to move forward. Also, confirm your KYC details like the name as per Aadhaar and the Aadhaar number and ensure they are accurate. You will then be required to enter information on the blank spaces marked red. The empty spaces have questions like E-mail address, marital status, qualifications, name, date of birth,gender, postal address and postal code, and father or husband name. Verify that all the information is relevant and accurate, enter the captcha code given below and enter a tick on the disclaimer box to agree to the terms and conditions of the organization. A Universal Account Number will be allocated to you, and a message will be sent to your registered mobile number. From the above procedure, we can see that it is easy to generate the UAN number for yourself instead of waiting for your employer to do so. Previously, the UAN generation had to be done by your employer,and this had to be done before the employer starts deducting the monthly Provident Fund contribution. Due to the numerous employees joining different companies every day, some with even similar names, the organization noticed details were being mismatched to the owner. After registering your EPF UAN, you will also have to activate it online. Make use of the guide given below to perform this action with ease. Visit EPFO’s Portal by typing in https://unifiedportal-mem.epfindia.gov.in on the search bar. Click on “Activate” UAN from the important links section. You will be redirected to a new page on the site from where you should enter the UAN number and EPF details. Fill in your PAN number and contact details before clicking on “Get Authorization Pin” option. Enter the OTP before clicking on “Submit” button. Your UAN will then b activated and linked to your EPF account. To simplify this, EPFO launched the direct UAN allotment services using Aadhaar for their members. Indian employee scan now generate their UAN based on their Aadhaar number. Everyone is quite happy because both the employer and employee can save time and resources by using this method. EPFO has made it mandatory that in India all private sector employees must have an EPF account. EPF stands for Employee Provident Fund. Not only in the private sector, is the EPF online payment facility available in all the government sector banks as well. The unified portal of the EPFO is a very big step towards making the whole process of EPF payment and facilitation as easy as possible for both the employers as well as the employees. There are endless services provided on the unified portal to make the process easy for one and all. Forgot UAN Password reset in unifiedportal-mem.epfindia.gov.in? The link https://unifiedportal-emp.epfindia.gov.in/ is specifically dedicated to the employers. Here the employer needs to enter the username and password to make use of all the services which are available to the employer. There are many services which are made available to the employer like registration of the establishments, online payment of the PF, filing of the monthly returns etc. But for using all these services the employer first needs to make an employer registration at the new UAN unified portal (if the employer has not already registered on the portal). The registration process is very easy and one just needs to provide the following details to register itself and to get the username and password. Details of the employer/company (Personal as well as related to the organization). If you have all, the process of registration is easy for you. Follow the below-defined steps to register yourself at the portal. Agree to the terms and conditions by making a tick mark before that and then click on the Submit tab. Now fill on all the personal as well as organization details with all the precision. Remember, when you enter the PAN, you need to enter the PAN of the company only. You should not enter the PAN of the authorized signatory here. After entering the Mobile number, you will instantly get an OTP which you will need for the authentication. Enter the OTP to authenticate the registration and then click on the ‘Register’ tab. If all goes well, the employer gets an SMS which will consist of temporary UN and password. The employer will need it to Login to the portal for the first time. After that, the employer can change them as per wish. 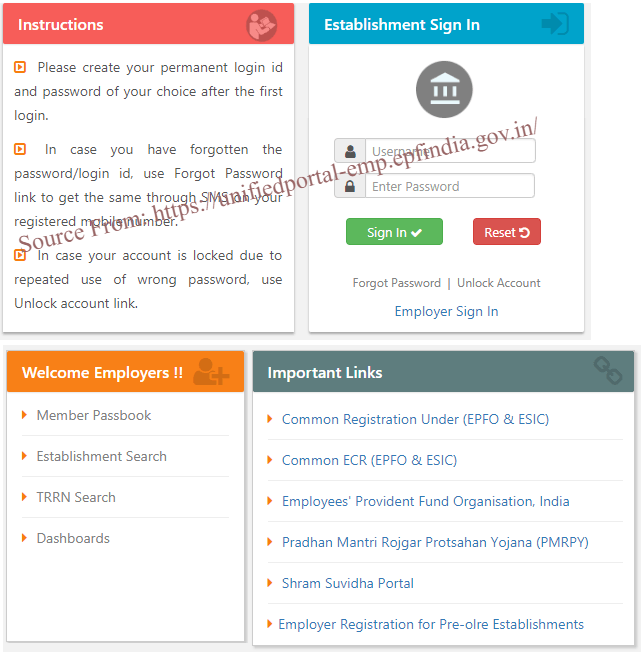 Now visit the employer portal with the link https://unifiedportal-emp.epfindia.gov.in/ and Login with the temporary UAN and password. It will then ask you to change them. Change them as per your wish. Now, remember, there are two types of Sign In (a) Establishment Sign In and (b) Employer Sign In. It is highly advisable to use the Employer Sign In for the company level and Establishment Sing-In for all the regular activities. Create a UAN for a new Employee. Make registration of new employee. Link a new employee to the already existing UAN. When you Login to the portal with the employer User ID and password, you will get to see six major tabs in which all the services are summarized very nicely. The 6 tabs are: (a) Home (b) Member (c) Establishment (d) Payments (e) Dashboard and (f) User. Let us discuss some of the major services provided to the employer on this portal and how to make use of them. UAN can be generated by both the employer and the employee. Here, as we are talking about the services that can be utilized by the employee, let us discuss how UAN can be generated by the employer. After login on the https://unifiedportal-emp.epfindia.gov.in/. You will see the home page. There will be a tab highlighting ‘Member’. Click on that. In the drop-down menu, select the ‘Register –Individual’ option. Use the Form-11 filled by the employee to enter the details of the employee on the portal. This reduces any possibility of error. Now, get a copy of employees AADHAAR Card and fill in the details of the employee from there. After filling in all the details, click on the ‘Submit’ tab. Instantly you will see that the UAN of the employee has been generated. This makes an employee an EPF member. Note: This UAN is used for the ECR submission. An employer can not generate the UAN of the employee unless he has the AADHAAR, PAN and Bank details of the Employee. If the new employee already has a UAN, the employer just needs to take the UAN from the employee and then use it on the New UAN portal of the employer. When the employer enters the detail of the UAN, there is an automatic generation of the employee detail. The employer just needs to use the option where he/she can change the employer details, mobile number etc. When the employer is changed, the new employee gets linked to the new employer automatically. In order to access the E-Seva portal of the EPFO, the employee must possess a bank account in any of the Government Bank. If one has a corporate account, it is an added advantage and makes the process of EPFO payment as easy as possible. If one has opted and accessed the online banking facility, he/she can easily transfer the money from the Government bank account to the EPFO account. Now let us directly talk about how to Pay EPF online. Just follow the below-listed steps to make the online payment of the EPF. Before starting to make the payment, just make sure that you have username and password handy to Login to the portal. For making the payment, you first need to login to the E-sewa portal of the EPFO. https://unifiedportal-emp.epfindia.gov.in/ is the official link of the EPFO. On the home page, make a login with the username and password. Now after Login, search or the ‘Payment’ option. In the drop-down list, click on the ‘Payment (ECR)’. On the new page, first of all, download the last month ECR. Make sure to download it in the Excel sheet form i.e. CSV format. Now in the excel sheet, fill in the details in the column carefully. After filling all the required columns, just save the file in the text form i.e. in the *.txt form. Next, you need to upload this file on the portal. After uploading, click on the ‘Proceed’ tab which is easily visible on the screen. It is now the time to generate the challan. Search for the ‘Generate Challan’ tab and click on it to generate the challan. If you will carefully look on the page, you will be able to find the TRRN. This is required for the ultimate payment of the EPF. Now download the Challan receipt and the Acknowledgement Slip. Now it will ask about the type of payment you need to make. Select the ‘Online Payment’ as the Payment Option. When you select this option, you will be asked to select the bank through which you want to make the online payment. When you pay the EPF money online, one gets the message of the debited amount on the RMN (Registered Mobile Number). Note: It is highly advisable that you must keep the ECR and TRRN with you for any future use. It is better to keep a print out of the online payment receipt. When you make a payment, you must keep one thing in the mind. There are certain administrative charges that gets deducted while making the payment. Mostly 0.85% of the Total EPF Wages is deducted and for EDLI 0.01% is deducted. There are two ways for the payment of EPF: (a) Payment (Direct Challan) and Payment (ECR). The selection depends on the mutual consent of both the employee and the employer. Under the payments option of the portal, one also gets an option for ECR/Return Filing. List of Services offering in the https://unifiedportal-mem.epfindia.gov.in website to know your UAN status and UAN Login Activation….. So you want to know about the services provided to the employees by the unified portal. Actually, the ‘member-interface’ of the unified portal is for the employees only and not for the employer or any other person. Actually, the unified portal presses for the linking of the Aadhaar to the PF account with the help of the UAN number. It is because only after the linking of the Aadhaar with the PF account the unified portal can provide all types of the services to the employees online. Once one has linked UAN to the Aadhaar, an employee can avail any of these services through the member interface section of the unified portal of the EPFO. Let us quickly start with the types of services it can provide. Unifiedportal-mem.epfindia.gov.in website is the link to directly reach on the member interface page of the unified portal of the EPFO. On the right-hand side window, you will see some boxes asking for some details related to your UAN number. Fill in the details and then click on the ‘Login’ tab. This will help you to Login to your EPFO unified portal account. After a successful Login to the page, you will be easily able to see your updated passbook at any time. The service is available 24 hours a day without a hitch. The monthly contribution towards your PF account from the employers’ side. Your contribution to the PF each and every month in your account. The contribution of the employer to the pension scheme of the employee. The current balance in the EPF account of the employee. If you want, you can even download your passbook. Just click on the download tab placed near the passbook. Once you have linked your UAN and Aadhaar at the unified portal, you will get all the information related to credits or any charges related to the EPF account through SMS on their registered mobile number. There is an EPF mobile application also that can be used to check all the activities related to the EPF account. To know more you can give a missed call on 9718397183. If you have Aadhaar linked to the UAN, you can easily present your EPF related claim to the EPFO with the help of the unified portal. For the validation of the claims, one does not need to reach out to the businesses. One can just access the unified portal with a Login and password and make a claim settlement. One must have UAN Activation. One must have the RMN (Registered Mobile Number) with him/her. One must have updated Aadhaar information. One must have an IFSC seeded bank account in EPFO database. One must have current and completed KYC detail. In case, the service tenure is less than 5 years, one must have a PAN number registered at the EPFO database. It is the prerequisite for the final PF settlement. Together with the prerequisites, you must know the type of EPF claims that can be withdrawn online. There are actually 3 types of claims that can be settled online. EPS (Employee Pension Scheme) Withdrawal. Full and Final Settlement of the EPF. So now, you know all. You just need to learn about how to apply for online EPF withdrawal process. The process is not complicated but needs a little knowledge about it. Let us start with the process. Log in to this page with the help of UAN and password. Search for the ‘Manage’ section on the page and then click on the KYC link. There check your KYC status and modify it, if it is required. Now click on the ‘Online Services’ link. There, click on the Claim (Form-31, 19 and 10C). There, you will be asked to choose from the three types of claim settlements: (a) Full EPF Withdrawal (b) Partial EPF Withdrawal and (c) EPS (Employee Pension Scheme) Withdrawal. After selection, submit the request. You will get an OTP on your mobile number registered with UIDAI. You need to authenticate your submission of claim request by using this OTP. Once you have entered the OTP, you will get a message of successful authentication on the screen. When you get it, consider that your claim has been submitted successfully. After the successful submission of the claim request, if you feel like checking the status of it, you can easily do so by using the tab ‘TRACK CLAIM STATUS’. Now after Login, look in for the ‘View’ section. Under it, search for the ‘UAN Card’. You will now be able to see the UAN card on the screen. Now you can easily download or print this card in the usual way. 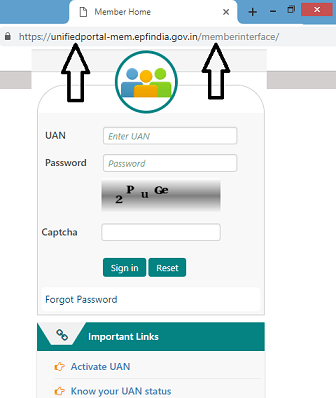 Login to the unified portal of the EPFO using the member-interface page or simply click the link https://unifiedportal-mem.epfindia.gov.in/. Now search for the ‘Manage’ tab on the screen. Click on that and in the list which appears, find the ‘KYC’ option. A list of related KYC information and documents will appear. Select the type of KYC information which you need to update. After you have updated the details, you will see that the status of the KYC has been changed to ‘pending’. Once the details are approved, you will be able to see the updated KYC information. After the approval from the employer, you will be able to see the status change as ‘Approved by Employer’. The information on the same will also be sent on your mobile. So you have seen that there are endless services provided by the unified portal. You can access any of these services if you properly logged in to the portal. For this, you need to activate the UAN by just linking the Aadhaar to the PF account. Once it has been done, the employee can avail all the services online without a hitch. There are many other smaller services also which are available on the portal. We will discuss them later. Services Offering List in EPF Grievance Portal http://epfigms.gov.in/…. We have discussed in detail about how the unified portal of the EPFO can be used to access all the services related to your PF account. However, it sometimes happens that we have some queries and we want to approach someone who can help us with those queries. In such condition, you can use the EPF grievance website. Not only this website is used to solve a query, but also to lodge a complaint. Yes, the EPF grievance website is very helpful to solve any query of the user or for the grievance redress. The website is excellently designed. On the site, a person can lodge the complaint in detail and he/she can also add the images related to the problems they faced while using the EPFO portal / services. The website assures that all the queries or complaints are solved within 30 days. But remember, the website can only help you if you have UAN. In relation to the withdrawal of PF. Form 13 for transfer of PF. On the site, any EP member, employer or pensioner can lodge the complaint at any time. One can ever raise the complaint against the employer as well. A complaint can be raised against any related EPFO also. All complaints on the epfigms.gov.in website have a resolve time of 30 days. If someone wants to get a quick resolution of the complaint, one can send the reminders of the same via this grievance portal. One can check the status of the complaint any time. If one does not get a satisfactory reply from the EPFO in the expected time of 30 days, one can even file RTI. If you want to register any grievance, just click on the ‘Register Grievance’ option present on the home page. Now you will be taken to a new window with the heading Grievance Registration Form, where you need to enter all the required details which are marked with an asterisk (*). You have to fill three types of information on this form. In the very first column of ‘Select Status’, you have to choose from the following four options: (a) PF Member (b) Employer (c) EPS Pensioner and (d) Others. Choose as per your wish. But if PF number is not known to you, choose the ‘Other’ option from the drop-down list. Now enter your 12 digits UAN Number. After that fill in all the details related to the PF. There is a specific format of the PF Number. First the region code, then the office and Establishment code, and then the extension or account number. Remember, if the extension is not known to you, you can enter three zeros (000) there to generate the PF number. Note: Based on your PF Number, the employer and EPFO office details get filled automatically in the form. Here, you first need to enter your name, if you are making the complaint. If you are raising the complaint on behalf of someone, you need to enter the name and address of the complainant. Now simply enter the name of your country, state, and Pincode of your residence or office. You can enter the phone number, however, it is optional. We recommend you to fill at least the mobile number and email ID for the purpose of convenience. In the enter grievance detail column, the first column that you need to fill in the ‘Grievance Category’. There are a lot of pre-selected categories to choose from. Choose the best category meeting your criteria. Once you have chosen the category of the grievance, you have to provide a description of your grievance in not more than 5000 characters. If you have any supporting documentation in favor of your complaint, you can attach the same in the next option of ‘Upload file’. The file needs to be attached only in the format of the pdf file. After uploading, click on the ‘Attach’ tab and then enter the Captcha code. Now finally click on the ‘Submit’ button. The registration number of the complaint. Information related to the office at which the grievance is lodged. The officer in charge of the complaint. Phone number of the officer or related office. 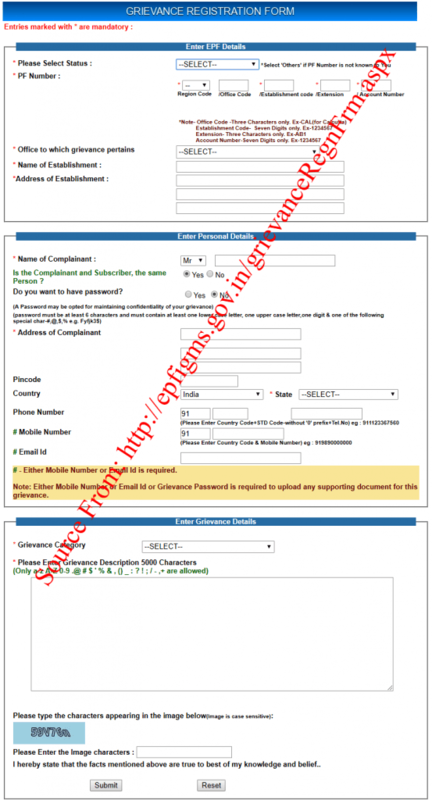 Email ID at which the complainant can make a query in relation to the complaint. Note: It is highly advisable that you must note the registration number of the complaint. It is because this registration number is always needed if one wants to track the status of the complaint. One can even send the reminders with the help of this registration number. After the complaint is successfully submitted, it gets verified by the EPFO. After verification, it is sent to the related department, office or person for the quick resolution. Mostly the resolution of the complaint takes about 15 to 30 days and not more than that. I hope the use of the epfigms.gov.in is very much clear to you. Just lodge a complaint and track the status easily with the complaint registration number. I hope you will get a lot of help with that. EPF is the common term used in referring to Employees Provident Fund, a government run scheme to all Indian employees of the organized sector. Members of the EPF are required to contribute 12% of their monthly basic salary towards this scheme. They can then access these savings as soon as they retire or when one is rendered jobless. Public Provident Fund on the other hand is a savings scheme operated by the government and can be accessed by every person regardless of whether you are self-employed, employed, unemployed or retired. PPF is not mandatory and there is no specific amount of money that you have to contribute as is the case with EPF. In this post, we are going to have a look at some of the differences which exist between EPF vs PPF. PPF is made available to every Indian citizen regardless of whether you have a source of employment or not. This means that students, self-employed, employees and retired people of India can become members of the PPF. On the other hand, EPF is only made available to salaried employees of a company registered under EPF Act. You can therefore not become a member of EPF lf you have no source of employment. All members of the Employee Provident Fund will have to part with 12% of their basic salary every month towards EPF savings account. However, you can increase the contribution voluntarily depending on your monthly salary and financial muscle. For PPF members, there is no fixed amount that one needs to contribute. You will only have to make a minimum contribution of RS.500 and a maximum savings of RS.1.5 lambs per year. When it comes to tenure, EPF allows its members the chance of closing their accounts as soon as they quit the current job. One can also opt to transfer the account whenever they decide to change a company. Members of PPF are easy required to make the saving for 15 years after which they can extend for a block of 5 years indefinitely. The Public Provident Fund is governed by the Government Savings Banks Act,1873 which has now been revised to Public Provident Act,1968. On the other hand, EPF scheme is under the Employees Provident Fund and Miscellaneous Provisions Act, 1952. Any investment in EPF qualifies for a tax deduction under section 80C of the Income Tax Act. The taxation is applicable to both the Employees and Employers contribution. Interests and withdrawals from EPF are tax free unless a member decides to access the savings within 5 years after opening the EPF account. When it comes to PPF, any investment in your account up to RS 1.5 lakh per year will get you a tax deduction under section 80C of the income tax act,1961. The interest and maturity amount are also exempted from tax as is the case with EPF. 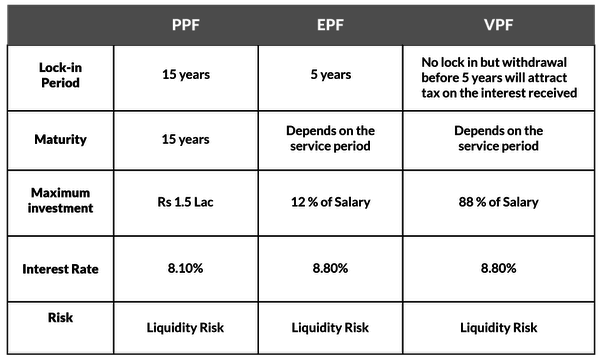 These are just some of the differences that exist between EPF vs PPF. The good news is that both the EPF vs PPF tend to be a safe method of statutory backing. 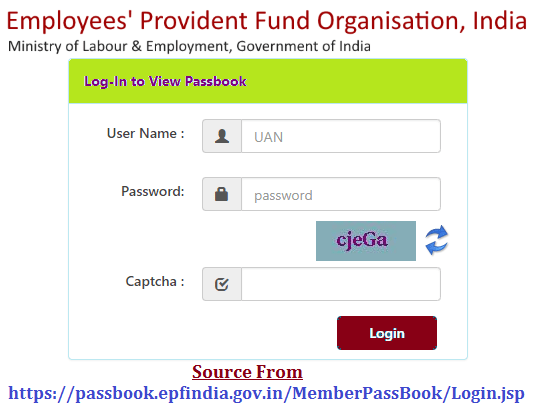 Procedure for how to consolidate / Merge Multiple PF accounts with UAN of one Employee to one epf account at passbook.epfindia.gov.in web portal…. The Employee Provident Fund Organisation (EPFO) has put in place a new facility to help members consolidate funds in their PF accounts by linking them with one Universal Account Number (UAN). This service is now available online thanks to EPFO portal. Any employee who wants to perform this action will need a fast internet connection together with their smartphone, Personal Computer or Desktop computer. Below are some of the things that you need to have before linking multiple EPF accounts with UAN one employee. KYC details like IFSC code, Aadhaar number, Bank Account Number, PAN Card. All these details must be verified by your current employer. Open your installed web browser and visit EPFO web portal by typing in https://www.epfindia.gov.in on the search bar. Press “Enter” button on your keyboard to initiate the search process. Once in the site, click on “Our Services” option from the main menu. This action will generate a drop down box from where you should click on “Employee Services” tab. You will be redirected to a new page on the site containing all the services listed under ‘For Employees’ category. Click on ” One Employee-One PF Accounts” option that can be seen clearly from the services section on “For Employee” page. Enter your registered mobile number linked with UAN in the box set aside for this option. You will then have to fill in your activated UAN number and member ID. A One Time verification Pin (OTP) will then be sent to your registered mobile number that is linked with UAN. Enter this OTP correctly to verify your details. Next, fill in the old EPF ID before accepting the declaration. Click on “Submit” button to send the request for merger of the current account to an existing PF account. The account merging facility will take close to three days after activation of UAN. To get the most out of this service, you will have to make use of a registered and updated KYC and Aadhaar details. Merging accounts is a good system by the Employee Provident Fund Organization. This is because it allows employees the chance of getting in touch with EPF authorities directly. You will therefore never have to make do with the long and tedious process of visiting EPFO officers in order to get the services that you need. EPFO is making use of the latest technology so as to offer different services to all the members. If you have multiple PF accounts, then it is advisable that you make use of One Employee-One EPF account service to get your money transferred within the shortest time possible. Alternatively, you can rely on OTCP to perform the action without getting assistance from any other person. Know your EPF Balance with UAN number or PF Balance check with UAN Number or via SMS or via IVRS at passbook.epfindia.gov.in website…..
From time to time people try to check the PF balance to know the amount of saving they have in their account. There may be some other added reason. Maybe, they want to avail some kind of loan against their EPF account or they want to plan the future expenses well. Whatever be the reason, the people always desire to check their PF balance from time to time. On the official page of the EPFO portal i.e. https://www.epfindia.gov.in/, search for the ‘Our Services’ section. From the drop-down Menu which appears next, select the option ‘For employees’. Now in the new window which appears next, you will again see a section with the heading ‘Services’. In that section, search for the ‘Member Passbook’ hyperlink and click on that. This link will take you to a Login page. You need to enter your UAN and password here. This will give you access to your EPF account. On its home page, you can easily check your PF balance. One can easily check the PF balance check by sending SMS. But before using this service, you need to meet some pre-requisites. The first and foremost condition is that you need to link your UAN with the KYC details. KYC details especially contain any of the following information Aadhaar or bank account or PAN. If you are sure that your UAN number is linked to the KYC, send the SMS as follows: (a) Write EPFOHO UAN ENG in the message box (b) Now send this message on the number 7738299899. Note: In the message ‘EPFOHO UAN ENG’, ENG is sent to get the message in English. The EPFO has provided the service that you can set your language of communication as per your preference, and for this, you just have to write the first three letters of the language in which you wish to receive the information. For e.g., if I wish to receive the information in Hindi, I have to write the message as ‘EPFOHO UAN HIN’ and send it on 7738299899. For Marathi, one needs to write MAR in place of ENG or HIN. It provides this service in about 10 languages i.e. Telugu, Malayalam, Kannada, Bengali, Tamil, Marathi, Punjabi, Gujarati, Hindi and English. First, you need to give a missed call on the toll-free number 011-22901406. Once you make a call, your call gets disconnected automatically or you can manually disconnect the call. After that, you will get an SMS which will contain all of your PF details including your balance. This is also another method of knowing the PF balance check with pf number. For this, you need to Login to the EPFO portal. First, keep your PF account number handy. The PF account number can generally be traced to the salary slip of the employee. Now reach out to the link http://www.epfindia.com/site_en/KYEPFB.php. On this new page, you first need to select the state. Here, don’t select the state in which you are residing right now, but select the state in which you had made the registration of your PF account. Don’t you know the state or registered office of your PF account? If not, don’t worry, you can easily make a search for it by visiting the link http://search.epfoservices.in/est_search.php. In the window which appears next, you need to enter personal details such as Name and mobile number, as well as your PF Number. In the end, tick the check-box in front of ‘I Agree’ and then click the ‘Submit’ tab. Now you will instantly get the information related to your PF balance on your registered mobile number. I think I have listed all the possible ways in which you can check your balance. There is one more way by which you can check the PF balance i.e. by using the official ‘UMANG’ App of the EPFO. I will discuss later how to use the UMANG App of the EPFO to avail all of its services and especially about how to check the PF balance using the UMANG App. If you have found any fault with the methods listed above to find the PF balance check with uan number, please do share it with us for the common good of all. 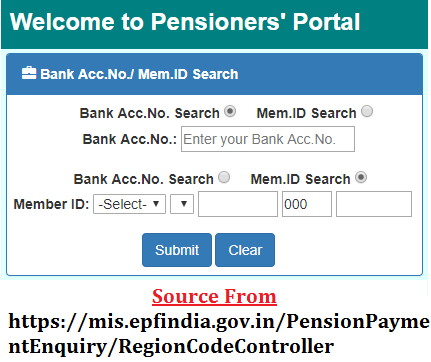 Track your PPO Pension Status using PPO Number and Know your PPO Number using Member ID or Bank Account number in mis.epfindia.gov.in website…..
very easy since pensioners have to rely on Epf India Website. This website has proven to be a step in the right direction since pensioners no longer have to go through tedious processes in order to get their PPO Number. Pensioners only have to look for a device that can access the internet together with an internet connection before using this site. You will then have to follow the step by step guide given below to get to know your PPO Number by using Member ID or Bank Account Number. Enter https://mis.epfindia.gov.in/ on the search bar of your browser. This link will redirect you to the homepage of Epfindia web application. You will then have to select “Member ID Search” option on the new page that appears on your screen. Pensioners can also decide to use the “Choose Bank Account Number Search” option. Any pensioner who is using “Choose Bank Account Number search” option will have to type in the account number. Enter, your Member ID in the space set aside for this information when using “Member ID Search” option. Click on “Submit” button once you type in your member ID correctly. This action will generate a box from where you can see the Member ID details like PPO Number, Pensioner type and Pensioner’s name. Pensioners can also get the chance to enquire about their PPO Payment by simply relying on Epfindia Website. This action can sometimes be difficult to perform especially if you have never used Epfindia Website before. However, you do not have to worry since the simple step by step explanation below will help you know your PPO Payment within a couple of minutes. You will first have to enter https://mis.epfindia.gov.in/ on the search bar of your browser. This is regardless of whether you are using Google Chrome, Internet Explorer or Mozilla Firefox. Press the “Enter” button on your keyboard once you type in the above link correctly. You will be redirected to the homepage of Epfindia website from where you should click on “PPO Enquiry/Payment Enquiry. This option can be clearly seen on the services menu of Employees Provident Fund Organization Website, India. A log in page will appear on your screen. Enter the login details correctly after which you should click on “Login” button to access your account. Next, fill in all the mandatory details correctly in the space set aside for each information. These details include Date of Birth, PPO Number and the PPO office. Enter the captcha code as it appears in the image. Alternatively, you can click on “Refresh” button to generate a new captcha image. Click on “Submit” button after filling in every detail. Now, choose the Pension Enquiry option that is present on the left side corner of this current page. You will have to click on “PPO Enquiry” option to have a look at the details. This action will open a new page from where you can see your PPO payment details. Knowing the PPO Pension status using PPO number is now very easy thanks to Employees Provident Fund Organization Website, India. Any person who wants to make use of this service without moving from their current location will have to follow the guide given below. Open your browser and enter https://mis.epfindia.gov.in/ as the official link for accessing Epf India web application. Hit the “Enter” button on your keyboard to access the page. This action will open the homepage of Epfindia Website. Alternatively, you can use https://mis.epfindia.gov.in/ to access the page for checking your PPO Pension status. A new page will appear on your screen from where you should select the office that issued your PPO. These details will appear in a drop-down list. Next, type in your PPO Number in the box that is specifically set aside for this number. Click on “Get Status” button after typing in your PPO Number. You will then be able to see the PPO Pension Status without facing any difficulty whatsoever. Employees Provident Fund Organization Website has quite a number of services that employees and employers can rely on. Initially, employees had to avail themselves physically in Epfindia offices in order to get these services. However, this is now a thing of the past since we are living in an internet era where most things take place online. Some of the services that you can get when using Epf India Website are explained below. In order to register your establishment, you will have to access Epf India website before clicking on “Establishment Registration” option. This action will open a new page on the site from where you should log into your account using a User id and Password. You can then complete the establishment registration by filling in all the mandatory details. This service is specifically set aside for any person who wants to check the status of their establishments. By doing so, you will be able to know whether your establishment registration was successful. You will have to open Epfindia website and click on “Status of Establishments” option. A drop down box containing details like List of Exempted Establishments, Exempted Return Manual and Provisional Monthly Estimate of Payroll. Click on the most suitable option to check your establishment status. Employees Provident Fund (EPF) members can update their KYC details online using Epf India Website. All you have to do is open the site and click on “KYC Updation (Member)” option. You can then make the necessary changes before finally saving this information. With Epf India website, you will never have to worry about getting any service that they have to offer. What is National Pension System (NPS)? Planning for your retirement through savings and investments is one of the most important things that should be put into consideration especially if you do not own a personal business. It is for this reason that the National Pension System (NPS) was launched by the Government of India. NPS is a low cost government sponsored scheme that was launched in 2004 with the aim of serving all employees of the government. This scheme was later on extended to all sections after an increase in demand that was as a result of the benefits that it had on government employees. In this article we can give the more data on NPS Account Registration. Cover old age security to all citizens. The NPS is available to all citizens of India who have attained the age of 18-60. Once a person becomes a member, you will have to make regular contributions which will then be placed in a pension account. Once a person retires, you can easily withdraw part of the savings and use the remaining amount to earn a regular income. Who can apply for the National Pension System (NPS)? Any Indian citizen who is 18-60 years as on the date of submitting their application to the Points of Presence Service Providers is eligible to apply for this scheme. You can either decide to join this scheme as an individual or using the employer-employee group so long as all the details and KYC documentation are submitted to the application authority. A Non Resident Indian can also be given the opportunity to become a member of the NPS. However, the personal account will be closed if one opts to change their citizenship. PAN Card that has been linked to their current bank account. A bank account that has Net Banking Facility. 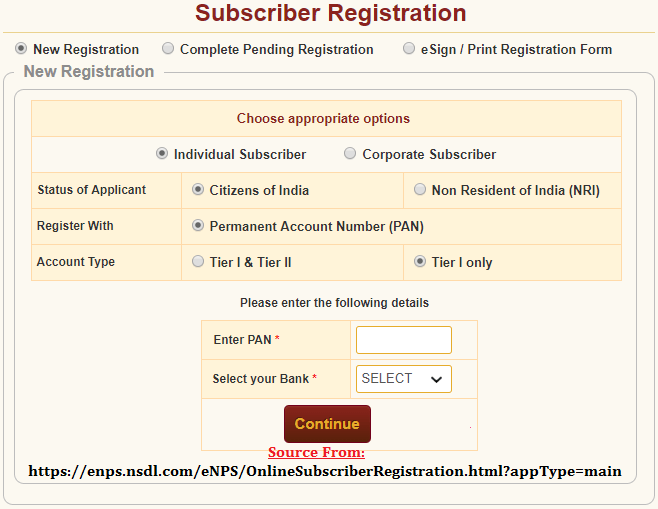 On the search bar of your browser, type in https://enps.nsdl.com/eNPS/NationalPensionSystem.html to log on to NPS Trust Website. Once in the website, click on “Registration”. This action will automatically redirect you to the online subscriber registration page. Here, click on “New Registration” option and select “Individual”. Enter your 12- digit Aadhaar number or the Virtual ID number before clicking on “Generate OTP” button. Enter the OTP that will be sent to your registered mobile number after which you should click on “Continue”. Any person who is using the PAN Number will have to wait for their bank to verify their details. This action will cost you Rs 125. Once you have selected “Continue” you will be able to get an acknowledgement number that contains your name. Select “Ok” after you receive these details. Correctly fill in your personal details and then click on “Save and Proceed” button. You will then be required to enter your banking details. Remember to use a bank account that has Net Banking Facility. Click on ‘Save and Proceed’ once this is done. This next step involves selecting the portfolio allocation from the four funds that are currently available i.e. corporate bond fund, government securities fund, alternative investment fund and equity fund. Once you have filled in the allocation details you will have to provide the details of people who will get the Corpus incase an investor dies. Upload your Scanned signature image, Passport size photograph and a cancelled cheque of your bank account. Finally, you will have to make your first contribution with a minimum of Rs 500 for Tier 1 and Rs 1000 for Tier 2. Once the payment has been made successfully, you will be given a Permanent Retirement Account Number (PRAN) together with the payment receipt. You will then be required to access the print registration page from where you are to select e-Sign with Aadhaar Card. Key in the OTP that will be sent to your registered mobile number for the Aadhaar to be authenticated. Your registration will now be signed electronically. A member of NPS can only withdraw their funds in only three scenarios i.e. Using the user ID and IPIN -The subscriber can decide to directly request for a withdrawal application using their own personal user ID and IPIN in the CRA system. This action should be done within a period of six months before the superannuation date that was selected by a subscriber. While requesting a withdrawal, the subscriber must give the Nodal office relevant bank details, Nomination details, Lump Sum percentage to be withdrawn, Annuity Service Provider details and annuity percentage share details. By POP/Nodal office/ Aggregator- When the subscriber cannot initiate the withdrawal request directly into the system then it can be initiated by a concerned POP/Nodal Office/Aggregator by using their logins. The subscriber will then be asked to submit physical withdrawal form together with other documents such as bank details, address proof and identity proof. These documents should be issued to the Nodal office. In case a subscriber dies, then the POP/Nodal office/ Aggregator will have to initiate a withdrawal request via the respective logins into the CRA system. The Nodal office will then have to confirm whether the withdrawal request form is correctly filled by the claimant. The KYC documents will also be looked into after which the authorization request will be initiated by the Nodal Office who will have to forward all documents submitted by a claimant. 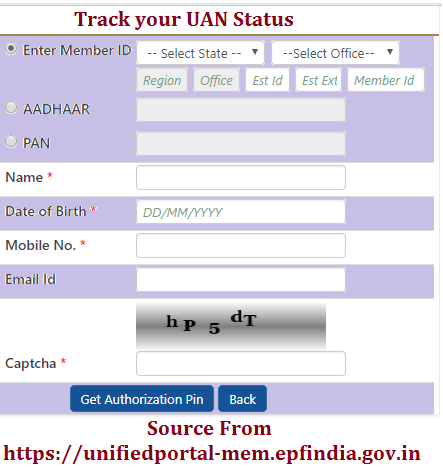 Know your Universal Account Number Status or UAN Status using with Member ID / Aadhaar Number / PAN number at unifiedportal-mem.epfindia.gov.in…..
Every employed person working in India must have a PF Account and a PF number which he or she will use to see and keep a record of his/her provident fund details. The PF Account is linked to the different employers of different firms. This means that in case an employee moves to another job, he or she will be given a new PF number, which is linked to the new employer. If you have changed jobs multiple times and you now have several accounts, you are expected to request Employees Provident Funds Organization to transfer all your previous funds to your current PF account. In October 2014, this organization introduced a service where an employee can handle all his Provident Funds accounts under one platform. In this article we can see detailed process on UAN Status checking procedure. So what is Universal Account Number (UAN)? This is a 12-digit number that is issued to all employees who are contributing towards their Employees Provident Funds. The number is given to employees to reduce the work of the employer in handling each employees’ EPF account. Employees find their UAN in their pay slips and if not you are encouraged to ask your Human Resource manager. The best part about using UAN is that after changing jobs, you will only need a new member ID, but your UAN shall remain the same. Purpose of Universal Account Number? The purpose of the Universal Account Portal is to centralize or put together all the employees’ data. This means that any employer can check out the employees’ data from any part of the country and this helps to save on time and resources. One of the roles of the UAN is to transfer funds from an employee’s previous account to the current one without having any issues. This organization has hugely simplified the whole UAN process, and this makes it easy to use. First, you need to confirm and get your UAN and KYC details verified by your new boss, and the accounts will be transferred. The whole process is more straightforward as it is done online. The main thing is to ensure that both the UAN and KYC details are accurate. Back in the days for a person to withdraw his or her funds after switching to a new job, he or she will require their previous employer to sign their withdrawal request. But after the introduction of the UAN, all the employees account balances will be transferred to their current accounts without the verification of their previous employer. The purpose of the Universal Account Number is to help all employees access their provident funds, withdraw and also confirm how much PF balance is left. Everyone must know to verify their PF balance by downloading an EPF passbook or UAN Passbook from their online portal. One gets a message after their employer has deposited funds in the Provident Funds Account. The whole process of employees claiming the UAN has streamlined their funds. This is because both the EPF and EPS balances from your previous employer are transferred to your current account. This is great as it also helps the employees keep a record of all their funds. The UAN portal was created to simplify the whole process of getting your provident funds even when moving from different employer to another. An employee can easily find his or her Universal Account Number from their new employer. He or she will give you the number allocated to you by the EPFO. You will see that other employers will print out your UAN in the salary slip too. Another way to get your UAN us by login into your online portal and acquiring the number. Log in to the UAN online portal which offers the UAN services using this link https://unifiedportal-mem.epfindia.gov.in/. After logging into the above mentioned URL. On the screen, press on the tab with the option “Know your status” option. It will be redirected to a page where you will fill in the relevant spaces with the relevant information. Select your state and from the drop-down menu enter your member ID then followed by your other details like name, date of birth, registration mobile number, your email address, etc. Then press the option “Get Authorization Pin,” and a new set pin will be sent to your mobile number, and this is the same point where you get to see if your status is active or not. Insert your new pin number and click on the “Confirm the One Time Password and get UAN” option. After some few minutes, your Universal Account Number will be sent to your mobile number.